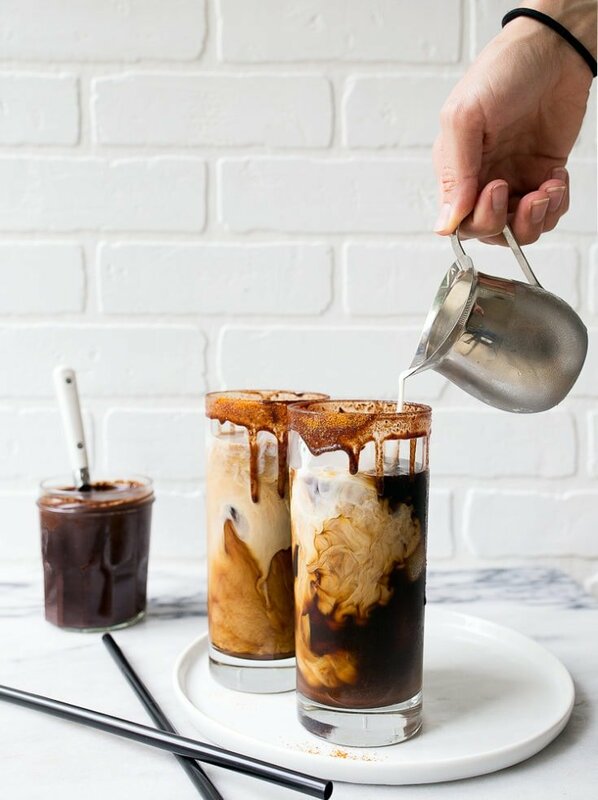 Spicy iced mochas: a homemade iced mocha with a spicy chocolate syrup. This post was sponsored by Gevalia. All opinions, recipe, and photos are my own. I’ve developed quite the coffee shop habit, as I’m sure you have, too. 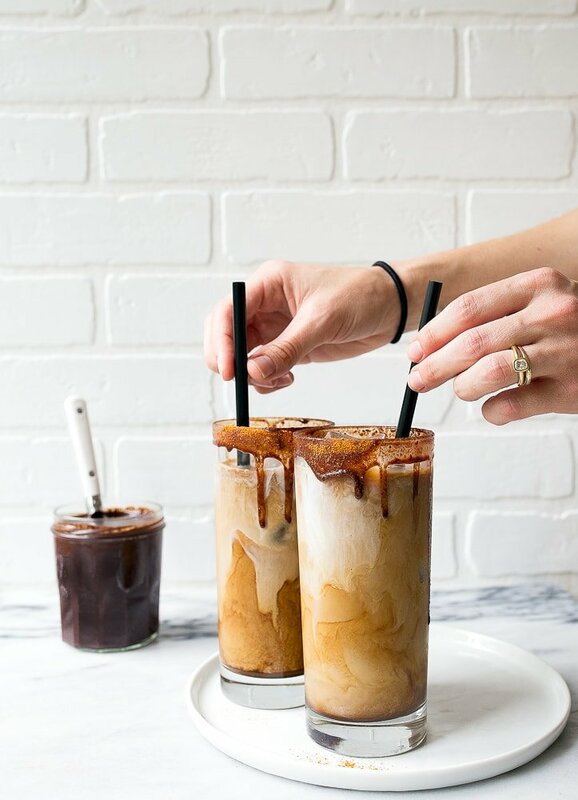 The warm weather just calls for an iced coffee, right? I have a coffee shop near me that makes spicy iced mochas with a bit of heat. The only way to describe it is: addicting. The chocolate sauce is spiked with cinnamon and a touch of cayenne pepper. Every time the heat hits your tongue, you just keep sipping more and more iced coffee to deal. Before you know it, you’ve downed a giant spicy iced mocha bigger than your head. So, it was time to turn my weekly coffee shop habit into a homemade iced mocha production. My game plan was this: I made a jar of homemade chocolate sauce that I spiked with cinnamon and cayenne (I store it in the fridge for easy access all week long), I grabbed a bottle of Gevalia Cold Brew Concentrate (totally love that it’s shelf-stable and concentrated so it’s easy to use! ), and my favorite iced cold milk (coconut milk lover, over here!). The three of these ingredients together? Oh, Mama. This drink makes me dance. One of the things I love about this chocolate sauce recipe is that it’s dairy-free. If you’ve stood in line at a coffee shop lately, you know that almost everyone in front of you is ordering their coffee with almond milk, coconut milk, hemp milk, or walrus milk. You don’t need cream or milk to make this rich chocolate sauce, because: honey. Honey makes it thick! And if you’re going to make chocolate sauce from scratch, you’re free to use help on the other stuff: grab a Gevalia Cold Brew Concentrate (I used the original or ‘House Blend’), and your milk of choice (please choose walrus milk), and get to stirring! 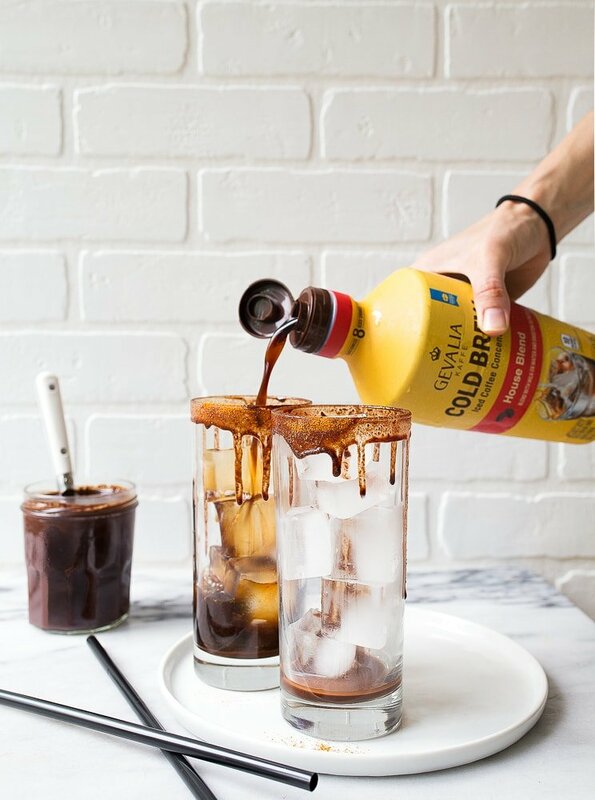 If you want to freeze some Gevalia Cold Brew Concentrate into an ice cube tray and blend all of these ingredients together into a frozen frappuccino, I bow down to you, lady. Or dude. Get the coffee shop experience at home, where the walrus milk is. I hope you know I’m kidding about walrus milk. Drink these with my small batch coffee cake muffins! A spicy iced mocha made with cayenne and chocolate syrup! First, make the spicy chocolate sauce: in a small saucepan, combine the water, coconut sugar, honey, cocoa powder, cinnamon and cayenne pepper. Bring to a simmer while constantly whisking. It will take some heat and time for the cocoa powder to totally dissolve. Bring to a simmer and simmer for 1 minute. Remove from heat and let cool completely. Store covered in the fridge. 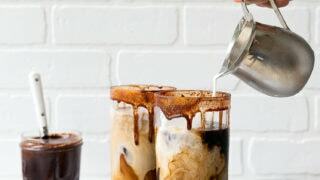 To make two spicy iced mochas: place 1/4 cup of chocolate sauce in the bottom of each cup, top with ice. Pour 1 cup of Gevalia Cold Brew Concentrate in each glass. Top with 1/2 cup cold milk (or more), to taste. Garnish with extra chocolate sauce, if you dare. Your pour shot is on point :) Good luck with the kitchen renovation! yes iced coffee is definitely an essential…in Texas its all year long thing. i cannot wait to try this new concentrate. Ooh, I will have to look for this brand in the store. I love iced coffee all year long, even when its snowing out. I love the idea of a spicy idea mocha, Especially if I can make it at home and it doesn’t cost me and arm and a leg. Sending you happy vibes on selling your house. Thanks for the recipe. WALRUS MILK! Oh my god. I screamed. I really did. In a coffee shop, of all places. I make my own cold brew concentrate each week. I will be making your spicy chocolate sauce and trying this out on the weekend!! Thanks! I’m very interested on trying this out! This looks amazing! Thanks, Sarah! You can leave it in the fridge, covered for up to 5 days. How long does the chocolate sauce keep for?